Really when you get down to it all football is situational football. Any coach who just has a football playbook full of plays, defenses or special teams schemes without an idea of the situations when they want to use them is going to struggle. This is why FirstDown PlayBook works hard to provide you with situational football. We know you can go into FirstDown PlayBook and organize a lot of your thoughts and situations on your own but we try to help you out as much as possible too. That’s why we organize so much of what you do on offense by either formation or concept and why we break your defenses down into base personnel as opposed to sub personnel and also organize your playbook by defensive fronts and coverages. Common sense stuff right? We also take the extra steps to listen to you the coach and two of our FirstDown PlayBook situational football sections that are part of your playbook exist almost exclusively because you asked for them. One is our Coverage Beaters section for the passing game and the other is our Spread Beaters section for the defensive coaches. Both of these sections were born from conversations we had with you. 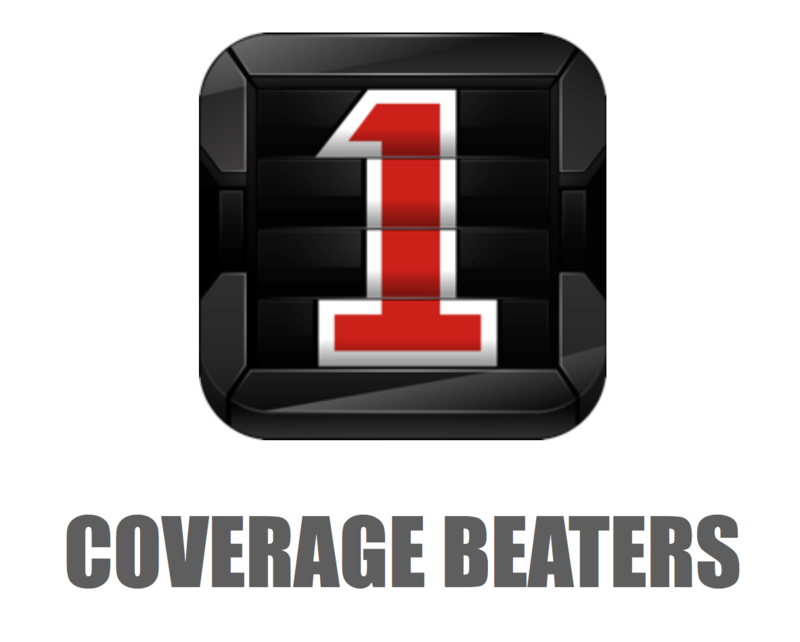 As we traveled the country last year talking to 7 on 7 people we heard a lot about how you needed help finding and teaching plays that would beat a specific coverage if that’s what you were getting the majority of the time. We also heard from the defensive guys who were facing the spread nine weeks out of eleven and wanted a specific package to combat this. We visited with some of the brightest minds in college football and our Spread Beaters package was born! So if you have never really taken the opportunity to “dig into” FirstDown PlayBook you don’t really understand what you’re missing. While having over 33,000 football plays at your fingertips is more than quite useful, having someone who organizes your playbook by situations is almost non-existent out there. Come on in and check it out! FirstDown PlayBook is the only Digital Football PlayBook that gives you access to over thirty three thousand football plays, schemes and technique help all designed by coaches and players with NFL experience. 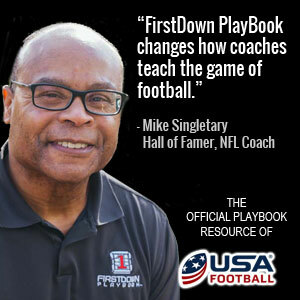 FirstDown Playbook is also the official PlayBook resource of USA Football and Football Canada..
Get FirstDown PlayBook for your entire football staff, league or organization! 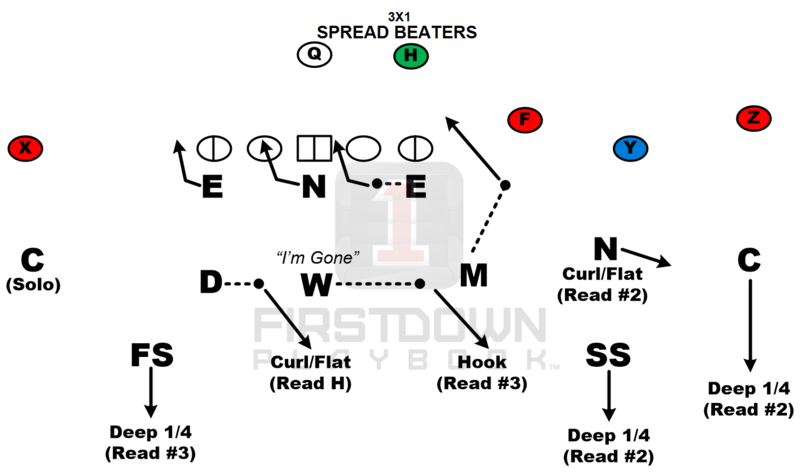 FirstDown PlayBook is on Twitter, Facebook, Youtube, Google+, Instagram and Pinterest! 1st Down Technologies is an Austin-based sports software company. We value your input. For any questions or feedback, please contact us. © 2019, 1st Down Technologies, LLC. All rights reserved. 1st Down Technologies, the 1st Down Technologies brand mark, FirstDown PlayBook™, AnyRoute™, and combinations thereof are trademarks of 1st Down Technologies, LLC. Other names are for informational purposes only and may be trademarks of their respective owners. Patent pending. Legal Information.